A lot of people with older AT&T devices still active have been getting letters similar to this one. AT&T last week began sending out letters to customers with old 2G-only devices still active on their plans, reminding them that as of January 1st 2017 those devices will become completely obsolete and unusable. And in some parts of the country - the shutdown may be coming even sooner. 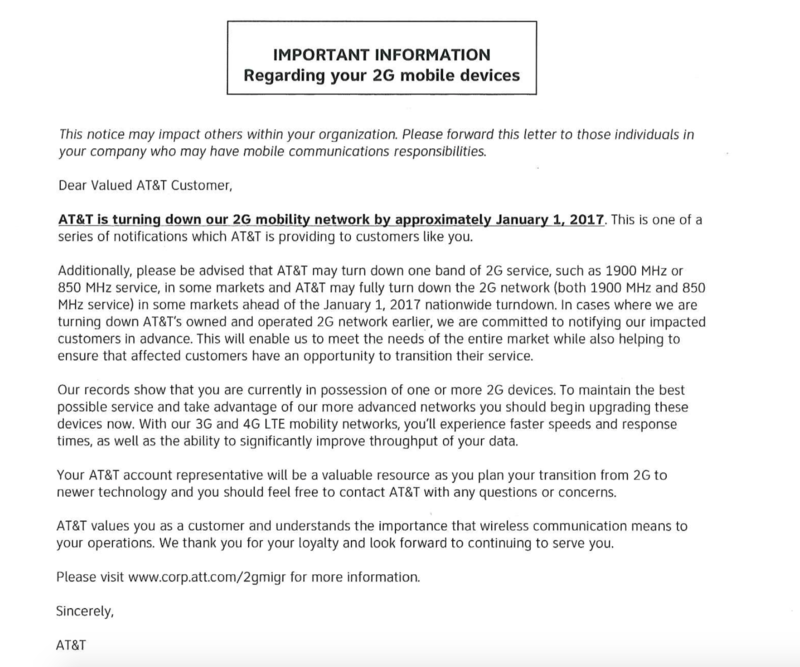 This is hopefully not news for anyone - AT&T hasn't sold 2G-only devices in years, and the company first announced the target 2017 shutdown date for 2G service way back in August 2012. But for those with old hand-me-down phones, this might still come as a surprise. And even for those with 3G and LTE devices - the 2G network shutdown may cut into the fringes of your coverage, particularly if you have an older LTE device without support for all of the more recently deployed LTE bands. 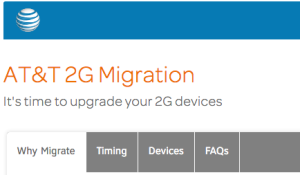 How Can You Recognize AT&T 2G? If you regularly see 2G, EDGE, or GPRS instead of 4G or LTE - you are overdue for an upgrade. Take a look at the top of your device screen - next to the network name and signal bars indicator if you see "2G", "EDGE", or "GPRS" you are connecting to AT&T's 2G network. Next, take a look at the AT&T coverage map - if there are other types of service in your area and your device is connecting via 2G - you are LONG overdue for an upgrade. If you have any less technical friends or relatives who have older phones, you may want to help them make sure that they are not stuck in a 2G world, or else they may get cut off from connectivity entirely. AT&T's 2G EDGE network was deployed beginning in 2003, and it was actually the network that powered the very first iPhone model. AT&T's EDGE was considered a 2.75G technology, and it was vastly faster than the original 2G GSM and GPRS standards that had preceded it. Mobile data traffic in the United States grew by 75,000 percent over a six-year span, from 2001-2006. In the eight years that followed, mobile data traffic on AT&T's national wireless network increased 100,000 percent, from January 2007 to December 2014. Reallocating capacity to our more advanced wireless networks will help more of our customers have a better experience. AT&T's 2G EDGE network had a maximum theoretical speed of 1000kbps, but in practice delivered 120-384kbps speeds. Upcoming LTE Advanced Pro technologies will have a theoretical capacity of 1000Mbps, a 1000x increase! You see - newer technologies (like LTE) are not only a lot faster, they are also much more efficient. This means that more customers can get online simultaneously for a given chunk of wireless spectrum. Think of it like tearing down an old horse-cart trail and replacing it with an expressway. But just like an old buggy can't keep up on the modern highway - old 2G-only phones just aren't compatible with the newer cellular technologies, and will no longer be able to connect at all once the 2G GSM network is turned off. AT&T's 2G network is deployed on two chunks of spectrum across the country - medium range 1900MHz PCS (now known as LTE Band 2) and longer range 850MHz classic cellular (now known as LTE Band 5). By phasing out 2G service on these two LTE bands, AT&T will be making space to further expand its LTE expressway. And indeed, in many parts of the country the transition has been well underway for years - with only minimal 2G service left active. Soon - it will be shut off entirely. What About 3G? Will It Get Shutdown Too? AT&T's 2G Migration FAQ says that AT&T currently has no plans to shut down its 3G network, and the reason AT&T can't is voice service. Only the most recent LTE devices support "Voice Over LTE" (VoLTE), meaning that the vast majority of AT&T phones are actually still dropping back to 3G service to make and receive voice calls. Only once VoLTE is widespread will AT&T be able to evolve away from 3G service - and that transition might not happen until the time for 5G networking arrives. But just because 3G networking will be kept around for a while on AT&T, that doesn't mean that it wont be scaled back. AT&T has already shifted some capacity away from 3G and "4G" HSPA+ networks towards expanded LTE, and will certainly continue to do so. To ensure that your devices have a long future of support on AT&T's network, look for Voice over LTE support, and compatibility with LTE Bands 2, 4, 5, and 17. Also keep your eye out for support for LTE bands 29 and 30, which AT&T has recently begun to expand onto. AT&T isn't the only carrier looking to phase out older technology to make more room for LTE expansion. Verizon: Verizon has a rough target of 2021 for a final shutdown of its 2G and 3G networks, after which point Verizon's network will be 100% LTE. But Verizon has already begun the transition, in many areas having drastically cut back 3G capacity to devote more resources towards LTE. If you are still using a Verizon 3G device, it will only get slower over time. Verizon's 2G CDMA network will likely outlive its 3G network in many areas, because CDMA is needed for voice calls on all phones that are not VoLTE compatible. T-Mobile: T-Mobile's 2G technology supports a lot of hard-to-upgrade systems, such as home security alarms, car trackers, and even vending machines. To keep supporting these types of customers, T-Mobile has announced that it has no plans to shut down its 2G EDGE network anytime soon - no earlier than 2020. T-Mobile has however transitioned a lot of its 2G capacity and much of its original "4G" HSPA+ network to LTE, and will continue to do so. Sprint: Sprint shut down its 4G WiMax network last November, but has indicated that it plans to keep its older 2G and 3G networks around "for the long haul", with no sunset date as yet even hinted at.